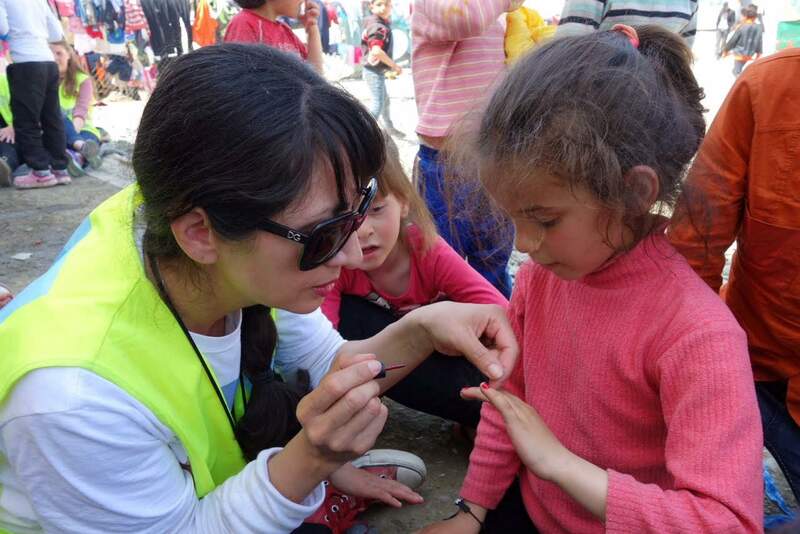 Kayra Martinez paints the nails of a Syrian refugee in Greece. Martinez, who grew up in Durango and is now a flight attendant for United Airlines, started Love Without Borders For Refugees In Need, a nonprofit that provides art supplies to Syrian refugees. The artwork is then displayed at art shows and sold, with proceeds directly benefiting the refugee. Kayra Martinez, white shirt, helps Syrian refugees in Greece make art projects. A flight attendant from Durango found her calling after moving to Europe and witnessing the poor conditions of refugee camps firsthand. Kayra Martinez began working for United Airlines in 1989 and was based in Germany. There, in her free time, she began volunteering, eventually helping organizations that took in refugees from the Middle East. Martinez said she was inspired to help refugees after witnessing the poor conditions of a camp in Greece. The camps, run by the Greek government, have since improved, but a few years ago, refugees mostly lived out of tents, she said. Because conditions were so poor, Martinez felt compelled to help. 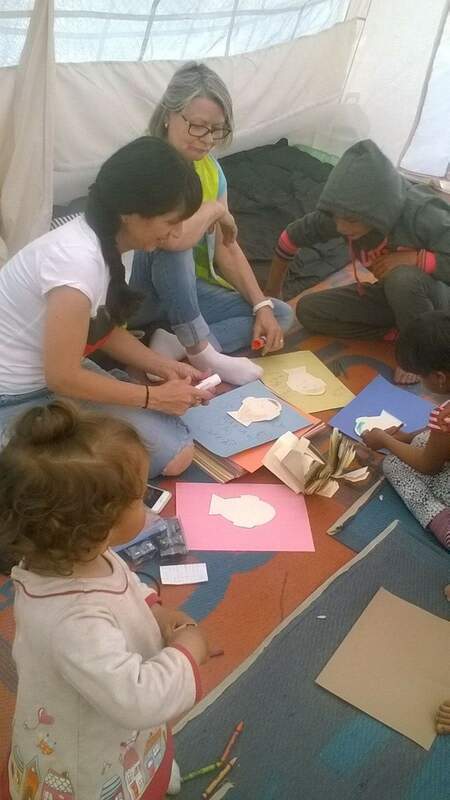 She began by bringing art supplies for children to entertain themselves at the Nea Kavala refugee camp near the border of Greece and Macedonia. The children, who came from Middle Eastern countries such as Syria, were so traumatized they would draw disturbing images, such as dead stick-figure bodies and capsized boats, Martinez said. But as she continued bringing them art supplies, the drawings and paintings became therapeutic for the children, she said. “I decided to really work on helping them to work out that trauma through art,” she said. The art is done across all mediums, but mostly on 30-centimeter canvases, she said. Martinez went on to start the nonprofit called Love Without Borders For Refugees In Need, and after friends found out about her work, they asked Martinez if she was going to sell the refugees’ artwork. Martinez decided to start hosting art shows to sell the art, with all the proceeds going directly to help the refugees, she said. In total, she has hosted more than 30 shows in the U.S. and Europe. Most recently, she hosted shows in California. She has never hosted an art show in Durango, but she hopes to find a venue by the end of this year, she said. All proceeds from the art shows go back to the artists, usually in the form of cash, Martinez said. If a family is in a situation where they can’t go to the grocery store, for example, then the organization will pay them through buying food. Martinez grew up in Durango and studied travel and tourism in Pennsylvania. In 1989, she became a flight attendant for United Airlines, where she still works today. Her brother, Jerry Martinez, is the owner of CJ’s Diner in Durango. Jerry said Kayra has always had a passion for helping people in need. Durango resident Micki Rhodes learned of Kayra Martinez’s work in a roundabout way. Rhodes, a retired Durango School District 9-R teacher, taught at a high school in Costa Rica for a year. A student from the Costa Rican school volunteered for Martinez’s charity after graduating, and told Rhodes about the project. Rhodes was captivated by the refugee art project and was stunned when she learned the founder was from Durango. She reached out to Martinez, and the two met in person in December. “It’s quite a life she leads,” Rhodes said. Volunteer work is like a second job for Martinez, who now lives in Nea Kavala, Greece. She works for two weeks as a flight attendant and then spends two weeks working for the nonprofit. In the next month, she will work with an educational group as well as a musician from England to teach science, music and art to refugees. Martinez said she has no plans to stop what she is doing. In addition to art, her goal is to guide refugees toward independence in their new home countries. “It’s very important to always ask them, ‘What did you do in Syria?’ ‘What did you do in Afghanistan or Iraq?’ because we can highlight those talents of theirs and create some jobs for them and some ways for them to earn their own money,” she said. Art can offer a window into a child’s psychology, and Martinez said she has seen this firsthand. She recalled a 7-year-old Syrian boy who created a gruesome drawing depicting suffering he witnessed in war zones. The boy and his family have since found a house to live in, and his drawings reflect upbeat life experiences, Martinez said. Martinez says the word “refugee” has a negative connotation, and assumptions are often made about them. “At the end, they’re human beings, and I think people should be open to get to understand these people a little more because it could really change their understanding about a refugee,” she said. For more information about Love Without Borders For Refugees In Need, visit http://lovewithoutborders4refugees.com/.